- Kaleb Mccormick - Automotive Window Tinting Class July 2014 - Big shout out to Mark Barkett and co workers at Exotic Car Services! Just finished up the five day Window Tinting School today, and I'm confident and ready to tackle some tint! I have three customers this weekend already, and others making appointments next week. With Mark's techniques, and simplified instructions cutting tint is becoming second nature already. Big thanks to Mark from Georgia Tint Company. - Jason Richey - Automotive Window Tinting Class April 2014 - Great people to deal with! 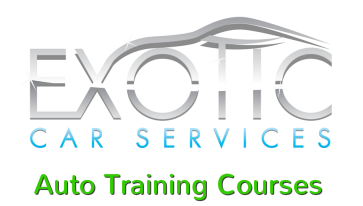 100% recommend Exotic Car Services for all your training needs! Hands on training, very comfortable atmosphere, by the time your training id done, you leave very confident and and with very close new friends. Thanks again for everything! - Rick T. - Flat Glass Window Tinting Class June 2014 - Thank you Mark for taking the time to teach me how to do flat glass tinting. After one day my confidence level skyrocketed. I thought we would be in class all the time but as well we trained hands on, on two houses and a restaurant. Thank you for also setting me up with a window film manufacturer. I will tell everyone I know about your school. - German Hoth - In October 2013, I took the 5 day Auto Window Tinting course and the 2 day commercial & residential class too here at Exotic Car Services. I can tell you that I was learning from day one for every minute of the class. Mark (my instructor) has a lot of experience and he knows how to teach you the right techniques in a very understandable way. I can assure you that this is the best hands-on window tinting training you can have. Before I decided where to learn this, I did deep research and I can tell you that there is no place that offers more value for your investment than Exotic Car Services. Right after my training I came back home to Boston, MA. and I did my first job and I feel really comfortable and confident because I practiced a lot during the training. Thank you very much Mark & Angela for your hospitality and knowledge. I highly recommend this course. (100% worth it). - Joseph Hansell - Automotive Window Tinting Class taken in October 2013. This was the best decision I made, mark took his time and showed me the ropes. My first day I was hanging window tint by myself.I can promise you , this was the best choice ...Thanks again ! - Josh Hernandez - Class taken December 2012. The BEST Automotive Window Tinting School on the East Coast, hands down. The instructor walked me through step by step, answered any and all questions I had, and made sure I came out of the school fully competent and with tools in hand. Highly experienced he made choosing this course a no brainer. His techniques were easy to remember and best around. Call them and see!